In Dashiell Hammett's famous crime novel, we meet one of the detective-story master's most enchanting creations, Nick and Nora Charles, a rich, glamorous couple who solve homicides in between wisecracks and martinis. At once knowing and unabashedly romantic, The Thin Man is a classic murder mystery that doubles as a sophisticated comedy of manners. 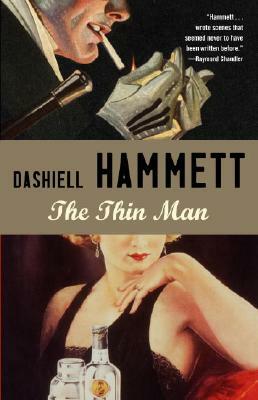 Dashiell Samuel Hammett was born in St. Mary’s County, Maryland. He grew up in Philadelphia and Baltimore. Hammett left school at the age of fourteen and held several kinds of jobs thereafter—messenger boy, newsboy, clerk, operator, and stevedore, finally becoming an operative for Pinkerton’s Detective Agency. Sleuthing suited young Hammett, but World War I intervened, interrupting his work and injuring his health. When Sergeant Hammett was discharged from the last of several hospitals, he resumed detective work. He soon turned to writing, and in the late 1920s Hammett became the unquestioned master of detective-story fiction in America. In The Maltese Falcon (1930) he first introduced his famous private eye, Sam Spade. The Thin Man (1932) offered another immortal sleuth, Nick Charles. Red Harvest (1929), The Dain Curse (1929), and The Glass Key (1931) are among his most successful novels. During World War II, Hammett again served as sergeant in the Army, this time for more than two years, most of which he spent in the Aleutians. Hammett’s later life was marked in part by ill health, alcoholism, a period of imprisonment related to his alleged membership in the Communist Party, and by his long-time companion, the author Lillian Hellman, with whom he had a very volatile relationship. His attempt at autobiographical fiction survives in the story “Tulip,” which is contained in the posthumous collection The Big Knockover (1966, edited by Lillian Hellman). Another volume of his stories, The Continental Op (1974, edited by Stephen Marcus), introduced the final Hammett character: the “Op,” a nameless detective (or “operative”) who displays little of his personality, making him a classic tough guy in the hard-boiled mold—a bit like Hammett himself.